Fierce Romance: Guest: Cynthia Owens + Giveaway! Welcome, Cynthia! We're thrilled to have you as our special guest today. Please tell us about yourself. Cynthia Owens: I believe I was destined to be interested in history. One of my distant ancestors, Thomas Aubert, reportedly sailed up the St. Lawrence River to discover Canada some 26 years before Jacques Cartier’s 1534 voyage. Another relative was a 17thCentury “King’s Girl,” one of a group of young unmarried girls sent to New France (now the province of Quebec) as brides for the habitants (settlers) there. Q: Please tell us about your latest release. Do you have a review you could share with us? 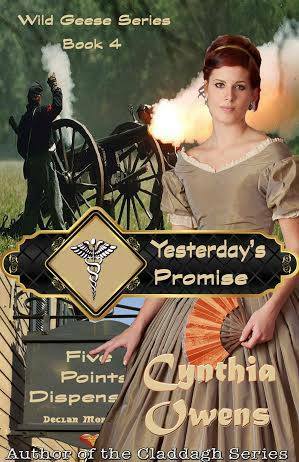 A: Yesterday’s Promise is the fourth book in my Wild Geese Series. It’s the story of battlefield surgeon Declan Morrissey and Valerie Stanton, the courageous nurse who served at his side. She broke the promises they made on the battlefield. Can they overcome their past and have the happily ever after they dreamed of? An army doctor, Declan Morrissey fought for the survival of every wounded soldier, rejoicing when they recovered, mourning bitterly when they died. Valerie Stanton was his beautiful battlefield nurse, strong, courageous, and dedicated. 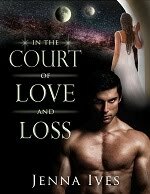 He never dreamed she was an heiress, or that she’d break his heart in a desperate gamble to save the life of another man. Now that they’ve found each other again, can they overcome past deception and claim the happily ever after they dreamed of? Q: Sounds wonderful! Please tell us about your favorite character in the book. A: Oh, do I have to limit it to one? I loved each and every character in this story, including my villains. I adore Valerie and Declan, both as individuals and as a couple. But if I really have to choose just one, I supposed it would be Edmund Stanton, Valerie’s tortured brother. His journey from a traumatized war veteran to a man determined to take charge of his life was an absolute joy to write. Q: He sounds great! Which element of story creation is your favorite? A: Definitely character creation. Let’s face it, creating the characters that make a story is a little like the child’s game of imaginary friends. Of course, the biggest difference between that game and story characters is that you can’t make your characters do what you want them to do. I’ve discovered through trial and error (and a lot of on-paper arguments with various characters) that it’s their story. They tell it to me, and then they guide my hand in writing it. Q: Very cool! What inspires you? What motivates you? A: History inspires. Ireland inspires me. Most of all, Irish history inspires me. There are so many stories in Irish history, both tragic and triumphant. Stories of famine and survival, of emigration and those who stayed behind. And of course, the legends and the music are wonderfully inspiring. In fact, the song The Fields of Athenry gave me the backstory for my very first heroine, Siobhán Desmond. What motivates me to write? An absolute and compelling need to tell my stories my way. Ever since I was a very young child, ideas, stories, characters and scenes have played in my mind, and they’d stay in my mind until I went to my room and wrote them down in my “secret book” (in reality a loose leaf notebook). I don’t know how many of those notebooks littered every conceivable corner of my room, but most of them were filled from cover to cover. A: It depends on the book. When I began writing Deceptive Hearts, Book 1 of the Wild Geese Series, I did extensive research, plotting and character creation. I had character sheets, timelines, and so on that I kept in a binder and referred to during the course of writing the book. With Yesterday’s Promise, it was completely different. I wanted to write Declan’s story and I came up with the bare bones of the story. I even had a heroine, Sarah, though I wasn’t completely happy with her. Then Valerie Stanton burst onto the scene, and I was off and running. No real plotting, no extensive character sketches, and not much research. But the characters were very real in my mind, and they willingly told me their story. And I had an absolutely wonderful time getting to know them! A: Like most writers, I suppose I will always remember “The Call.” It was July 15, 2006. I’d had some correspondence with my editor already, so I knew she was interested in In Sunshine or in Shadow (Claddagh Series, Book 1), but I’d had too many rejections to really get my hopes up until I signed the contract. I think I screamed. I know I cried. Then I flew up two flights of stairs to tell my husband…and I woke the kids as a result. A: I like to have a lot of projects going at the same time, and right now I have four. At the moment, I’m wrapping up Wishes of the Heart, which I hope to have on my editor’s desk in the next few days. 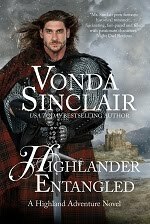 It’s the seventh book in my Claddagh Series, historical romances set in Ireland and beyond, and it’s Cinderella-with-an-Irish-twist. Once that’s done, it’s time to think about Christmas. I’m working on a novella that’s a spin-off of My Dark Rose (Wild Geese 3). The Christmas Mirror shows Nuala Donavan where her heart truly lies. After that, I’ll write the final full-length novel of the Wild Geese Series, The Carousel, Kieran Donnelly’s story. And while I’m working on those stories, I’m planning a new Irish historical fantasy series, The Five Princesses of Glenrath, set on a mythical island off the Kerry coast which is based on Tir na nOg, the legendary Land of the Ever Young. I’ll be giving away a signed copy of Deceptive Hearts, Book 1 of The Wild Geese Series, to a lucky commenter! Check out this fantastic and emotional excerpt! Thank you again, Cynthia, for being our special guest today! I'm so pleased to be back at Fierce Romance, thanks so much for having me! Looking forward to meeting all your readers and making some new friends. Thank you for being here with us today, Cynthia!! Yesterday’s Promise sounds wonderful, Cynthia! Thank you for sharing. Loved your interview. I find it fascinating that you plotted your whole first book out and then changed your writing technique with later books. I've always been an "into the mist" writer, but I always sort of envy people who can plot. The ideas just don't flow for me when I try. Best wishes on your book. Hello Cynthia :) You are a new to me author. This series sounds amazing and I put the first book on my tbr , I also picked up your In Sunshine or in Shadow because it was on sale and the sample already had me hooked. I followed your Bookbub instead of Amazon because it just seems to work much better. Congrats on your new release and I hope to be able to catch up on your series soon. Your books sound intriguing, Cynthia, especially since some of my distant relations hail from the Fair Green Isle. I look forward to checking them out :-). Thank you, Lane, glad you enjoyed it. And thanks for the visit! Jean, I love to connect with my readers, it's one of the greatest joys of being a published author. Good luck in the contest, and thanks for dropping by! Thank you, Mary, I like to think I'm proof positive that inconsistency works! ;) Thanks for the visit! Hello, Crystal, so pleased you'll be reading In Sunshine or in Shadow, I certainly hope you'll like it. Thanks for visiting me here at Fierce Romance! Doris, I hope you do check out my stories, and that you enjoy each and every one of them. Thanks for the visit! Hi Dawn, so nice to meet you, too. Glad you enjoyed the interview. Hope you enjoy my stories. 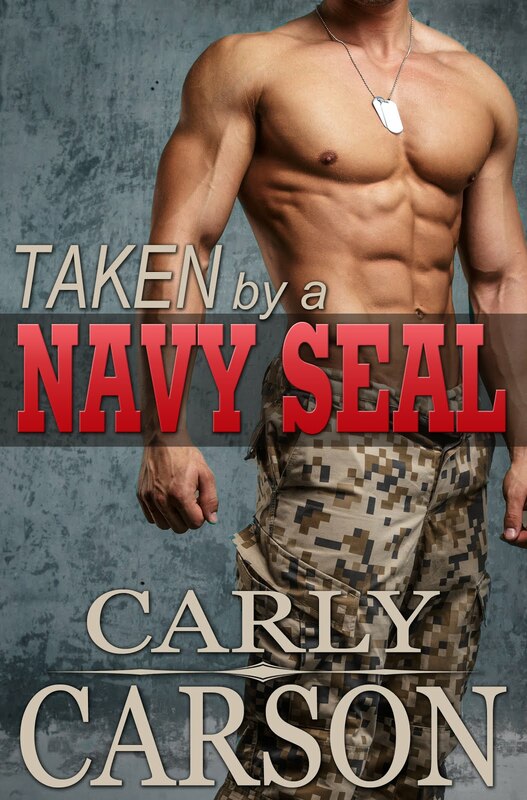 Thanks, Cathy, I hope you enjoy Declan and Valerie's story! Thanks for the visit! Another beautiful cover! Good luck with your book. I really like the sound of your new book, Cynthia. Best of luck with it. Thanks, Barbara, and thanks so much for visiting me here! Great to meet you here Cynthia. Lovely to meet you, too, Mary! And the winner of the signed copy of Deceptive Hearts, Book 1 of the Wild Geese Series, is Jean Flowers! Congratulations, Jean! Please e-mail me at authorcynthiaowens@gmail.com with your snail mail address, and I'll send you your prize. And thanks again for visiting me at Fierce Romance!